An unaccustomed approach to marketing umbrellas, clustered as if Blackberry Drupelets on a heavy-duty, all-metal Strip Merchandiser. The advantage? The umbrellas can pop up anywhere storewide like flowers after a spring rain (but better seen during the rain). The disadvantage? 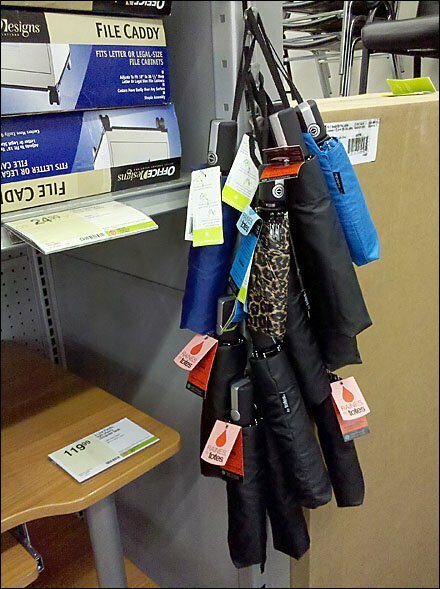 As with many umbrella displays, the umbrellas themselves are not immediately recognizable from a distance. Each is a single drupe hiding among many drupelets.